Kuhn North America is offering three working widths in its new third generation gyrorake. Hay producers interested in versatility in raking equipment have three new choices from Kuhn North America in the firm's newly designed Generation III Gyrorakes. 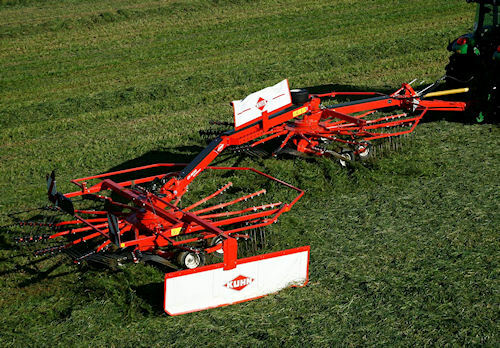 Available in working widths of 15' 7", 18' 5", and 21', the GA 6632, GA7932 and GA9032, respectively, are capable of forming one large single windrow or two separate windrows for the ultimate in hay meadow versatility. The GA9032, at 21', is the widest swing-frame Gyrorake Kuhn has ever offered, and is aimed at follow-up work behind wide mowers. Kuhn's new Gyrorakes aim for versatility, performance and durability. Three working widths are available. The Gen III rotors offer faster raking speeds, larger windrow sizes, and improved durability over previous models. The Masterdrive gearbox is specifically designed for heavy crop conditions and long life, and the maintenance interval on the series has been raised from eight to 200 hours. For more information on the new Gyrorakes, click on www.kuhnnorthamerica.com.